Dropleaf table sets are on Sale! 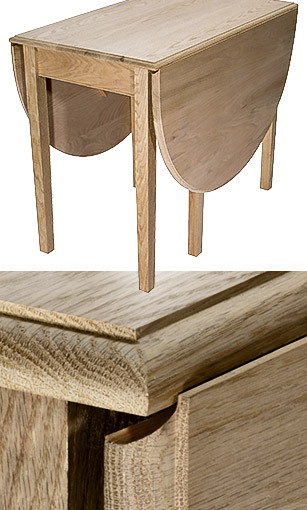 Make perfect rule joints for your traditional dropleaf table. Set includes Carbide Tipped cove and round over bits. Use with 3/4" stock. Use the 5/8" set when mounting hinges on the surface. The 1/2" set is used when recessing hinges. I had never built a Drop Leaf table and tried to construct the Rule Joint by using a 1/2" round over in conjunction with a 1/2" cove bit and could never get it to match correctly. So I bit the bullet and ordered the 1/2" Drop Leaf Table Set. Best money I ever spent. When it arrived I tried it out on some scrap and it worked perfectly the first time. Excellent product! I recently purchased this router bit set to build a new table top for an old gate leg table. The bits matched perfectly. I also enjoyed watching the instructional video. This is a very satisfying project that is not difficult if you follow the plans and watch the video. I made the first table for a daughter living off campus in a small apartment. The legs and apron were beech and the top ¾ inch birch plywood with a 2 ½ solid wood edge. For simplicity, leafs were rectangular. My legs were tapered with a shop made jig. The roll top edges were perfect after adjusting the set ups with a few test pieces. I didn’t like the underside stops so I drilled 5/8 shallow hole in underside of the leaf and a corresponding hole in the gate leg as an alternative. I used the triple cutter half round and cove that I had previously purchased and loose tenons instead stubs.